Thank you for your interest in Two Bears Trading Company! 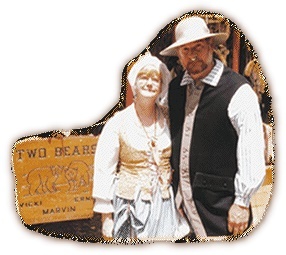 We specialize in the finest fur, leather, and accessories for re-enactors. We have earned customers' trust through 25 years of mail-order trading. Now OUR TRADING POST IS ONLINE. Our goods are unique... so we may call after you order to confirm what you need. TwoBears travels to Reenactments, Gun Shows and Powwows throughout the year (see TWO BEARS CALENDAR). We look forward to serving you there and online. Questions? Please EMAIL TwoBears or call toll-free (888) 863-2652. We can only stay in business if you are satisfied.